Wow, did I say yesterday was a long day? Yeesh. TODAY was a LONG day. I actually slept in just a bit, but when the phone rang at 8am I knew exactly what that meant. As I had suspected, a chick was down at the MCC. Sean and I went into action mode and five minutes later were at the base of the MCC. Sean spotted the chick first. I cringed. She was laying down, which is not a great sign, in the entryway of a restaurant directly across from the nest. I walked to her slowly, gently scooped her up and put her in our pet carrier. I called Mary with the news. 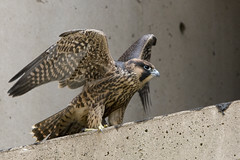 I called Katrina to tell her we were on our way up and give her the quick rundown on the falcon’s behavior – eyes bright, lively though favoring the left side heavily and unable to stand steadily, laying on the ground. I ended the call and flipped my phone closed. That’s when I discovered my cell phone was behaving abnormally. I opened it again and it typed a bunch of zeroes for me before trying to connect me to home base and sports scores – wha? I’d never even seen that screen before. As we zipped up to the zoo in a cab, I played with my phone. By the time Sean and I got to the zoo, my cell phone had, I’m sad to say, expired. The WORST timing ever. I almost NEVER need a cell phone, but this time of year? Yeah, I’d say it’s pretty danged important. Gah. Katrina greeted us at the doorway to the vet clinic at the zoo and hustled us inside. She and one of the bird keepers moved the MCC chick from our carrier to one of the zoo’s carriers. The MCC chick hissed and glared in a quite lively fashion, causing us all to take heart. The zoo’s head vet had been out on rounds when I called, but was on his way back to the clinic. Since I had one more chick on the ledge and thought it likely this one wouldn’t be going home any time soon, I decided to take my leave before he got there. I thanked Kristina profusely as she promised to call with an update as soon as the vet looked the chick over. Sean and I decided to find an AT&T store to replace my phone before heading back down to the jail. I am happy to report that the store had us in and out within 15 minutes, new live phone in had. Good! About halfway back on the Broadway bus, my new phone rang. Mary reported that the other chick had fledged. Apparently, Dawn Smith, the St. Michael’s monitor and a Flynt Creek Wildlife Rehab volunteer, had been called about the first chick and had gotten there just after Sean and I had picked her up. But! She was right in time for the last chick to take her first flight. Mary told me that Dawn would stay until Sean and I got there. We got off the bus pretty soon after the call and got into a taxi – faster. When we arrived about 10 minutes later, I immediately spotted tall, blond Dawn. She stood near the truck entrance of the federal garage on Congress and Clark. She pointed up as Sean and I got to her and there, on the second story of the garage, sat the third chick. She looked great! She glared down at us for some time before settling down onto her feet to nap a bit. Dawn said that the first flight had gone more or less well, but we all worried about her placement, sure that her second flight would send her straight down onto busy Clark Street. Dawn stayed for awhile, then went home to get her giant bird net. When she got back, we tried to get close to the fledgling with the net, but she flew over our heads to land on the Men’s Hotel across the street. I must say, she looked great in the air. I noticed as she swooped up to land on the small sill of one of the Men’s Hotel windows, that her compact tail dipped down in a perfect rudder type motion. I’ve seen a few birds fledge and I can tell you, one of the things you notice as a difference between fledging falcons and adults is the placement of those tail feathers as they swoop up – the fledglings don’t quite know what to do with them so they are fanned out about as wide as they can go, whereas the adults keep them nice and compact, making tiny placement adjustments as they rise and fall in the air. At long last, Dawn had to leave. For the next seven odd hours, Sean and I monitored the chicks. Max and Herc made many, many visits, trying to lure the chick off the ledge with a wide assortment of bird treats. The chick seemed interested, but absolutely refused to try flight again. 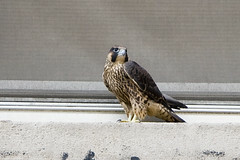 Several times, she actually turned her back on her parent and splayed out on the ledge for a nap. At about 7pm, she settled down on her stomach for yet another nap after a mad wing exercising session. As she closed her eyes, Sean and I decided we’d be safe leaving her awhile. We were STARVING. When I came back after dinner, I sat and watched her for about an hour. She strutted up and down the ledge and exercised her wings a great deal. Max and Herc were both nearby and she called to them a couple of times. Finally, just after sunset, she settled down again for a snooze. By this time, I was dead on my feet, so I made my way home, vowing to be up early to check on her. Hopefully, this one will fledge without incident! Good luck Chick #3! ~ by Steph on June 22, 2008. For those of you not from the Chicago region, the information on what to do when you find a downed peregrine is still valuable, even if the numbers are not. It is highly probable your own area has monitors. My suggestion would be to try wildlife rescue organizations or rehabbers, Animal Control and/or any zoo or natural history museum type place in the area.